Reflecting on two decades of experience, Gender Politics in Post-Communist Eurasia offers new and important insights into contemporary global gender politics by leading scholars from Central Asia, Europe, and the United States - into the contemporary dynamics of gender politics in a critical area of the world. The volume includes case studies of Romania, Russia, and Tajikistan; comparative analyses of Azerbaijan, Kazakhstan, Kyrgyzstan, Tajikistan, and Uzbekistan; and regional examinations of Eastern and Central Europe and Central Asia. The interdisciplinary contributions focus on issues such as the influence of global and regional norms on women's rights, the impact of international political economy on women’s social and economic positions, and the implications of international and regional migration and human trafficking for women’s lives. 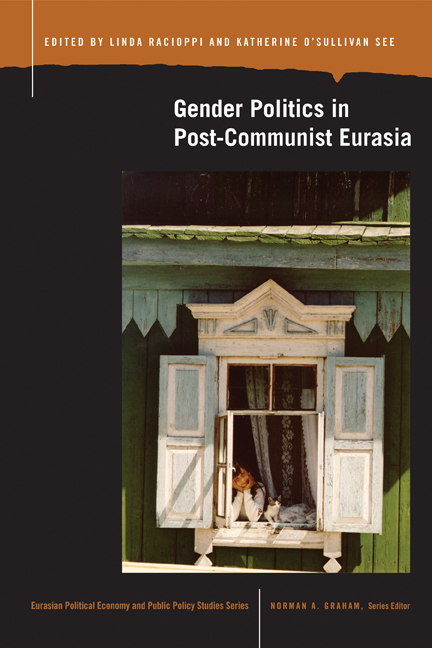 Gender Politics in Post-Communist Eurasia provides wide-ranging analyses that capture the distinctiveness of specific countries and regions while illuminating the interplay between the local and the global in gender politics. Linda Racioppi is Professor of Comparative Cultures and Politics and International Relations at James Madison College, Michigan State University. Katherine O'Sullivan See is Professor of Comparative Cultures and Politics and Social Relations and Policy at James Madison College, Michigan State University.